Lufthansa will transfer most of its Embraer 195 from regional subsidiary Lufthansa CityLine to Austrian Airlines. Starting in autumn the first E-Jets will replace older Fokker 70 and Fokker 100, Lufthansa told today. Austrian Airlines is already launching a program this year, earlier than planned, to renew its medium-haul fleet. This was decided upon by the Management Board of the Lufthansa Group. 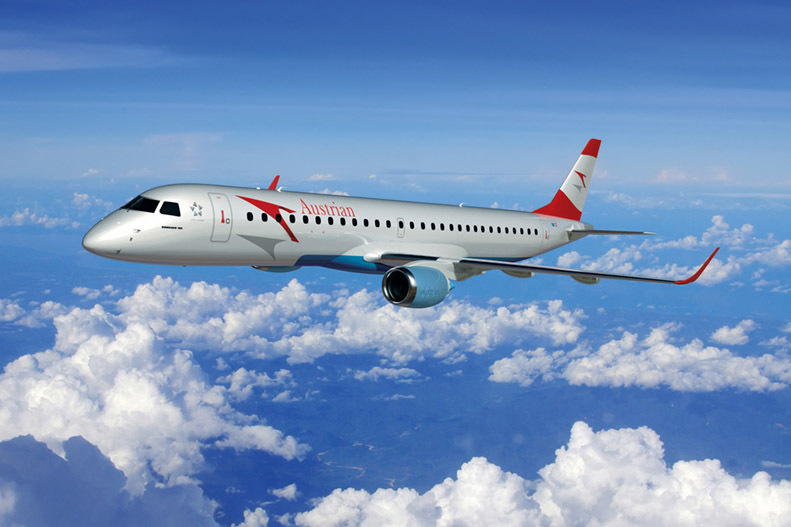 This year the Austrian Airlines fleet of Fokker aircraft will begin to be replaced by medium-haul jets produced by Embraer, contingent upon the formal approval of the Supervisory Board of Austrian Airlines at its meeting scheduled for March 19, 2015. The Embraer jets, type 195 are currently being deployed by Lufthansa CityLine. The renewal program is to start in the autumn of 2015 and is expected to be concluded at the end of 2017. Plans call for the first Embraer 195 jet with the typical red-white-red tailfin of Austrian Airlines to be in operation before the end of 2015. At present, Austrian Airlines operates 21 Fokker 70 and Fokker 100 aircraft. For the time being, a total of 17 Embraer jets will be transferred from Lufthansa CityLine to the Austrian Airlines fleet. The aircraft will come from Lufthansa CityLine, which in return will receive Bombardier CRJ900 NextGen jets from Eurowings. In terms of the number of seats, the production of the fleet will remain basically the same: The Embraer aircraft boast 120 seats and are slightly larger than the Fokker planes with 80 and 100 seats respectively. It has not yet been decided whether Austrian Airlines will receive additional medium-haul airliners. The Embraer 195 aircraft currently have an average age of four years (built 2009-2012), compared to the average age of 21 years for the Austrian Airlines Fokker fleet. The value of a new Embraer 195 jet is about USD 52 million. Details are currently being worked out on how Austrian Airlines will finance the aircraft. The most important factor pertaining to the airliners are the ongoing costs. Fokker aircraft are considered to be very reliable thanks to the good maintenance work on them, whereas the larger Embraer aircraft use about 18% less aircraft fuel per seat. This makes the Embraer jets much more environmentally compatible than their Fokker counterparts. “We spent a long time considering which option would be the best solution for Austrian Airlines. The Embraer jets are excellent and well-established aircraft. As you know, we also recently took a look at the Bombardier C-Series. We ultimately decided in favor of the Group solution. It enables us to begin the fleet renewal program this year“, says CEO Albrecht in commenting on the fleet decision.